Working with oil can be frustrating, particularly if you aren't able to maintain your grip on the object you're trying to hold. 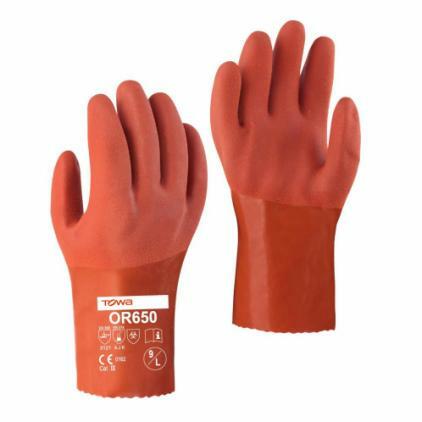 The Towa OR650 25cm PVC-Coated Oil-Resistant Gloves feature a soft PVC coating with a rough finish for excellent resistance to oil resistance and enhanced grip in wet and oily conditions. These gloves are orange in colour. Their product code is OR650. The PVC-Coated Gloves have been tested to EN 388, which is the European standard that gauges a glove's resistance to a range of physical threats. Please see the table below for a breakdown of the results. The Towa OR650 Gloves are available in five different sizes to ensure they're as comfortable as possible. Please refer to the measurements below to find the gloves that are most suited to your needs. A conformity statement is available to view for these gloves. To do so, please click the PDF link below.